Wood floors and dogs do not mix. Unless you are prepared to declaw your beautiful furry friend (which you should never do), you need to adjust the floor to the dog, not the dog to the floor. Trimming nails is not a comprehensive solution, either. Blunt, broad-tipped nails can still gouge the sealer, creating long, shallow dents. Layout as many runners as you like: your dog will not remain confined to them, guaranteed. The best floor for a home with dogs is not wood at all. Take your pick of any alternative: vinyl, laminate, tile, stone. All are better than wood. But if you still want wood, go for these super-hard species as measured by the industry standard Janka hardness scale. Whenever you want the hardest hardwood, exotics tend to be the way to go. Brazilian hardwood flooring is universally hard and dense. Beyond that, it is mostly a matter of personal preference. Ipe, often called Brazilian walnut, is hard enough that it is even used on exterior decks. A number of years ago, ipe entered North American markets at premium prices. Today, ipe has come down in price as to be affordable by more homeowners. If you are looking for flooring on the domestic front, hard maple is a top choice. Hard maple has long been used as a surface for basketball courts, so it should stand up well to pet traffic. Hard maple can hit a Janka rating of 1,450 or higher. Do not confuse hard maple with just any old maple. It is a specific type, alternately called sugar or rock maple. is produced from trees grown north of the 38th parallel [roughly above a longitudinal line drawn between San Francisco and Richmond, VA] where shorter growing seasons produce maple with closer, more uniform grain. Despite its impressive hardness ratings, hard maple can gouge if the dog is heavy or unusually active. Bamboo is a grass, not a wood, but in the flooring industry it is often classified as wood and can be subjected to a Janka hardness test, too. Bamboo flooring is durable, but its secret lies in the manufacturing process. The only reason that grass can function as a "hardwood floor" is because it is impregnated with loads of hard resins. Cali brand's Fossilized bamboo flooring has a Janka rating of an astronomical 5,000. Compare this to an equally admirable Janka rating of 2,000 to 3,000 for conventional strand-woven bamboo flooring. Not long ago, wood-look substitutes did not fulfill their primary function: looking like wood. Recently, many types of floors that contain no wood have begun to look very similar to wood due to improved imaging and embossing techniques. Wood-Look Ceramic Tile: Tile is no longer square but plank-sized, just like short wood planks you purchase for flooring. More importantly, the graphics are more realistic. Many wood-look ceramic and porcelain tiles will give up their true origin only under close examination. Wood-Look Laminate Flooring: Laminate flooring may not have the cachet of real wood, but it is superior to most woods in one way: scratch-resistance. 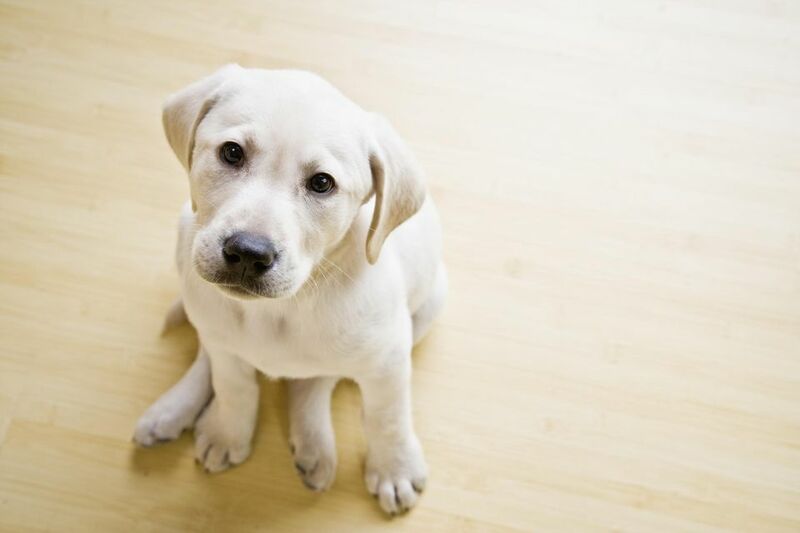 Laminate will not resist deep scratches of the type caused by sliding a refrigerator, but its wear layer does an excellent job of warding off lighter scratches of the type that dogs' claws inflict. Pre-Finished: Pre-finished wood floors are stained and sealed in the factory with multiple layers of alligator skin-tough aluminum oxide-impregnated urethane finish. Hardwoods: Softwoods such as pine or fir are poor choices for houses with dogs. No amount of site-applied surface preparation can shield against dog claws. Solid Rather Than Engineered Wood: Engineered wood flooring, a sandwich of laminated wood with a real hardwood veneer on top, is an excellent product. The only issue is that it can take only a limited number of light sandings. Scratch marks can be sanded down hard one time. Subsequent sandings pose a risk of exposing the structural wood beneath.